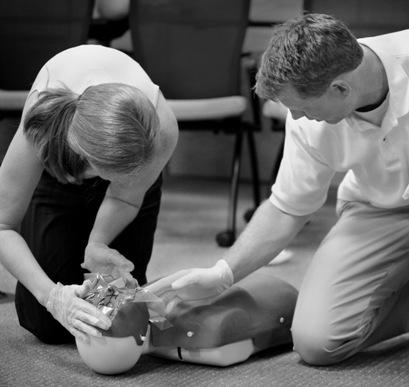 CPR Training Professionals is the leader in CPR classes in Orange County. We offer award winning, OSHA compliant and affordable CPR classes taught by expert instructors. Whether you need training to satisfy an job requirement or you just want to know how to keep your loved ones safe, we have a CPR class for everyone. American Red Cross CPR and First Aid class meets OSHA workplace requirements and teaches you to respond to cardiac and breathing emergencies for adults, how to use an Automated External Defibrillator (AED), care for conscious and unconscious choking and First Aid including burns; cuts; head, neck and back injuries and more. *This course does not include Pediatric (infant and child), if you need pediatric certification select Adult and Pediatric First Aid/CPR/AED from the program options. Online Course: This is a blended learning course including an online portion and an instructor-led classroom skill session. The online portion must be completed prior to attending the in-class portion. You must complete the online pre-course portion prior to class, and provide proof of completion by printing out your online course completion record or showing the completion email from your cell phone. This American Red Cross Adult and Pediatric First Aid, CPR & AED certification class will prepare you to recognize and care for a variety of first aid, breathing, and cardiac emergencies involving adults, children and infants. This class meets OSHA/workplace requirements and meets the CPR requirement for the California Teaching Credential. This is a blended learning course including an online portion and an instructor-led classroom skill session. The online portion must be completed prior to attending the in-class portion and must be taken on a PC or tablet with a high speed Internet connection. Allow approximately 2 hours and 30 minutes to complete the online portion. This is a classroom only course, no online course is required. American Red Cross CPR and AED class meets OSHA workplace requirements for CPR and teaches you to respond to cardiac and breathing emergencies for adults, how to use an Automated External Defibrillator (AED), care for conscious and unconscious choking. *This course does not include Pediatric (infant and child),if you need pediatric certification select Adult and Pediatric CPR/AED from the program options. This American Red Cross Adult and Pediatric CPR & AED certification class will prepare you to recognize and care for breathing, and cardiac emergencies involving adults, children and infants. This class meets OSHA/workplace CPR requirements and meets the CPR requirement for the California Teaching Credential. This is a blended learning course including an online portion and an instructor-led classroom skill session. The online portion must be completed prior to attending the in-class portion and must be taken on a PC or tablet with a high speed Internet connection. Allow approximately 1 hour and 30 minutes to complete the online portion. This instructor-led American Red Cross CPR certification class incorporates the latest science and teaches you how to respond to breathing and cardiac emergencies to help victims of any age – adults (about 12 years and older) and pediatric (infants and children up to 12 years of age). This class meets OSHA/workplace CPR requirements and meets the CPR requirement for the California Teaching Credential. American Red Cross BLS certification class is designed to train Healthcare Providers to respond to cardiac and breathing emergencies for adult, child, and infant victims with a focus on team-based response, BLS builds the key critical thinking, problem solving, and team dynamic skills that are needed to drive better patient outcomes. Duration: This class is approximately 2.5 hours. Online Pre-course: This is a blended learning course including an online portion and an instructor-led classroom skill session. The 2 hour online portion must be completed prior to attending the in-class portion. The American Red Cross BLS review class is designed to give individuals the opportunity to review the course content within a formal class setting. The format optimizes a participant’s ability to successfully compete the knowledge and skill evaluation. To be eligible to participate in a review course, the participant must possess a current healthcare provider-level American Red Cross certificate (or equivalent). Those without a current BLS certificate may not participate in the review course option. Duration: This class is approximately 2 hours.